Sparks are flying as Majesco has announced a new videogame development deal with Martha Stewart Living Omnimedia Inc., prompting observers around the world to ask: Is this kitchen really big enough for two Cooking Mamas? Under the terms of the deal, Majesco, the company that over the years has brought us such smash hits as Jillian Michaels Fitness Ultimatum 2010, Babysitting Mania and of course the Cooking Mama series, has exclusive worldwide rights to publish a series of games based on Martha Stewart Living's "expansive portfolio of award-winning lifestyle content." They're thrilled, Martha's confident, gamers will be delighted, etc. Everyone seems happy with the deal, in fact, except for one person: Cooking Mama. The original videogame kitchen queen is "really pissed off," according to anonymous insiders, over what she sees as an attempt to muscle in on her exclusive media market. While the specifics of Stewart's deal with Majesco are unknown, rumors that Mama was flown in to northern California by private jet for discussions with an unnamed, competing publisher have begun to surface. 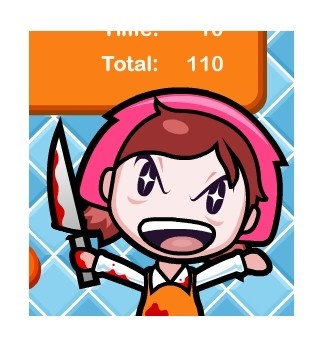 In an attempt to capitalize on the heat while it still has both lifestyle celebrities under contract, Majesco has announced the development of an all-new videogame franchise entitled Martha vs. Mama: Kitchen Kombat, in which the dueling doyennes square off in bloody, one-on-one virtual battle. The new game will include 12 unique levels based on famous kitchens from around the world, complex combat mechanics and special power-ups including double-edged cleavers, dual-wielded melon ballers and an innovative "Call a Friend" option in which Martha pays a few buddies from the pen to come over and rough up Mama's husband. No release date has been set.